The iPhone 5C pre-orders have already gone live, and it seems that the yellow, 16GB iPhone 5C has already sold out on Apple’s website. Both blue and green 16GB iPhone 5C models have sold out, and shipping times for both the blue and green iPhone 5C have been pushed back to as late as October 4th. It looks as though blue and green iPhone 5C customers will be forced to wait another two weeks before these models make their way into consumer hands. It’s a bit disappointing to have to wait even longer for your iPhone, I know. 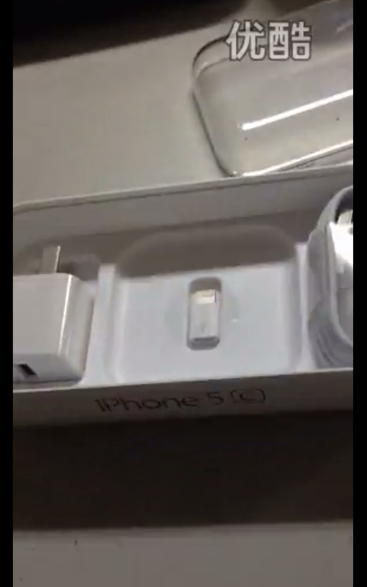 At the same time, however, we have video footage coming out of China that shows one of the first iPhone 5C unboxings we’ve seen so far. The video comes from YouTube member “iJailbreakerTV,” who has 20 subscribers. 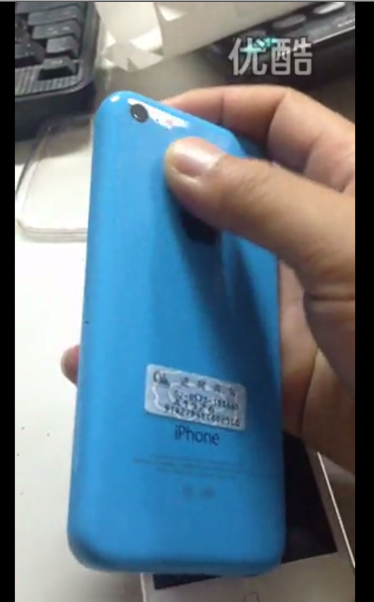 In his iPhone 5C unboxing video, he “takes the wrapper” off the blue iPhone 5C. Those of you who ordered the blue will get a chance to see how it will appear when you take the wrapper off of your own. First, Apple is to be credited with the elegance of the packaging. When you first pull your blue iPhone 5C out of the box, you will notice that there is a laminated cover to your iPhone 5C display that mimics what your actual display will look like on the phone (once it’s turned on and the main desktop showing iOS 7 appears). The “sticky adhesive” screen protector looks so elegant at first glance that you won’t want to take it off your iPhone 5C. Eventually, you’ll have to (if you want to use the phone for which you paid what will eventually be $549 over a two-year contract). 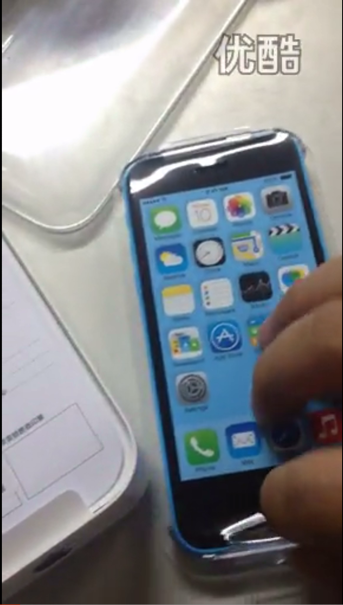 The adhesive cover is blue (to match your iPhone 5C color and screen color). 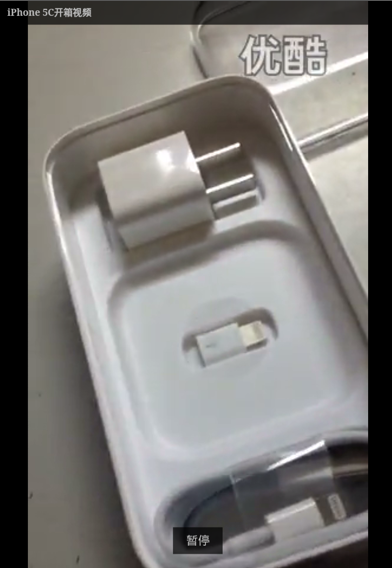 Once you take it out of the box, the iPhone 5C unboxing video shows that you have an Apple manual, not to mention your lightning to USB cable and a wall adapter. I like how easy it is to put the wall adapter piece in place, then disconnect it when you want to connect to your computer. All these things are done Apple-style. Make sure to purchase an additional lightning to USB cable with your iPhone 5C. Currently, I own an iPhone 5. My lightning to USB cable just broke last night after six months of daily use. I would say that, in my experience, six months has been the maximum amount of time (the exception being MacBook cables) that I’ve been able to use an iCable before it breaks (yes, I just coined the word “iCable”!). Be sure to purchase an additional cable so that, when your in-the-box cable breaks, you can use the spare. I had to break out my second iPhone 5 cable last night. Surprisingly, the video shows that there seems to be a USB cable at the far end of the box, with another USB cable (or an extension). As for whether or not you’ll get two extensions, this one is a “wait-and-see” possibility. 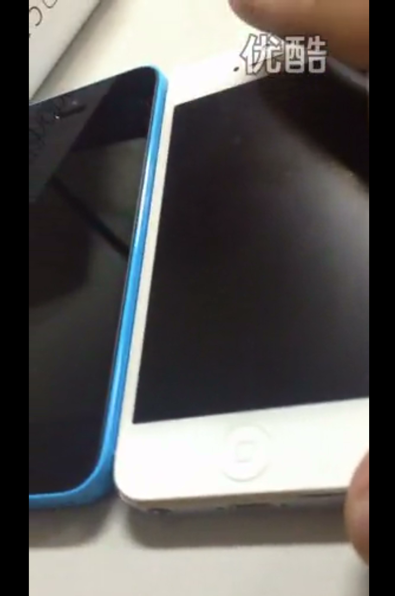 YouTube member iJailbreakerTV showed off the blue iPhone 5C against the white iPhone 5, and one can see that the iPhone 5C is similar in many ways to it. The same home button is there (in contrast to the new iPhone 5S Touch ID button), not to mention screen size. The iPhone 5C is a little heavier than the iPhone 5, however, but you may or may not feel the difference in hand since it is likely negligible. Along with the negligible heaviness is also a bigger battery. According to my sources, the iPhone 5C comes with a 1,570mAh battery while the iPhone 5 carried a 1,440mAh battery (a difference of 130mAh). You may not notice much difference in Wi-Fi web browsing with these two, although LTE browsing may prove differently. The blue iPhone 5C is the same exact plastic iPhone we’ve seen in video footage and photos before, the exception being that none of those models were ever “unboxed” or even boxed to begin with. The iPhone 5C unboxing video also shows the phone app, which has been redesigned in iOS 7 with a simple white background with circles around the numbers needed to make calls, and the Apple logo and “iPhone” label are all in their respective places (as is the 8-megapixel iSight camera at the back right of the iPhone 5C. What else do you need to know about the iPhone 5C? You’re in for a treat. The display packaging will take your breath away – and the plastic iPhone will melt your heart. The iPhone 5C, along with the iPhone 5S, will arrive in retail stores this Friday, September 20th at 8am. What iPhone 5C unboxing videos have you seen that you think are interesting? Let us know in the comments. If you’ve ordered your iPhone 5C and you want to share your excitement with us, we’d love to hear from you as well.